Codeforces Round #170 begins soon, and I'll be the problem setter. I hope many people will be happy to solve all the problems. UPD: The scoring is dynamic. The problems are sorted by increasing of estimated difficulty. And the standard part: thanks to Gerald for his help with the problems, Seyaua and sdya for testing the contest, Delinur for translations, MikeMirzayanov for building the Codeforces platform. http://codeforces.com/blog/entry/6777#comment-123735 are you the same guy ? it may be one of the way to get positive votes. Let's do our best, then. really fantastic for me!! thanks a lot!! Y U NO stop acting like a potato? Why did you add potato? How can I get positive votes in blogs? Please, help me!!! Just write good things, bro!!! And things that have meanings!!! А какие задачи нравится вам? I hope that the scores will be the highest. 4 problems with Score 3k :v Nice contest! what is wrong with testcase 4 of 2C ??? Perhaps a scenario in which nobody speaks any language? [sorry ! I just wrote it when no answer was available]. all the vertices have degree 0 so everyone should learn a language !! All of the employees know nothing. last 15mins I have problems with connection to codeforces. is this only with me or with all? Very FAST system testing @ Div 2! But it failed on similar test case! admins please clarify? now I read problem B can someone explayn why length of answer<=2??? Because not all combinations of 1 or 2 letters can appear at the same time. Ah, I thought the length of string is <50! What an epic fail! Hard problems but very interesting! but in this contest the speed of coding was too important to be helpful for coders! for me, I enjoyed solving div1 B.
anyway I think speed of coding is important part of a good programmer. When the "Razbor" will be onnounced?! The contest was very hard but the system testing was too fast! And did you understand anything? If did, then could you make it clear for me? That was really fast system testing! DIV1-B. [extracted from rng_58 source code] For case m = 3, n >= 5 there's no solution. m = 3, n = 3/4 one can construct big triangle and a point near one of the points of the triangle. For other cases (m > 3) one can construct (as rng_58 did I think) "function X^2" for one convex polygon (points (i, i * i + LARGE_DELTA)), and "function -X^2" for the rest of the points (poiints (i, -i * i — LARGE_DELTA). DIV1-C. It can be considered as nim game. For every row/column with coordinates [1 .. maxCoordinate — 1] count the number of "free" unit segments ("free" = not covered by any move played). Let that number be countRow_r for row r, or countCol_c for column c. Then nim sum would be NIM_SUM = (XOR_SUM countRow_r) XOR (XOR_SUM countCol_c). So by the theory of nim game first player wins if NIM_SUM != 0, otherwise second wins. Then we have to find a move which makes NIM_SUM equal to zero, and by the theory of nim games that move exists. DIV1-E. Construct graph with two nodes u_in, u_out per one node u originally given in the input. Attach the "source" to u_in with capacity 2 and cost 0, attach u_out to the "target" with capacity 1 and cost 0. Then attach u_in to v_out with capacity 1 and cost DISTANCE(u, v) when v can be a child of u (ie. v.y < u.y). Then run min-cost-max-flow and if the flow is n — 1 you can construct the graph and output it minimum cost, otherwise no solution exists. "number of free segments >= NIM_SUM. It can be proved that such row/column exists." Not necessarily. You only have to find one such that ("Y" xor NIM_SUM) <= "Y". The other condition would work for some cases but it's not guaranteed to always hold, unlike this one. Thanks, that was my error. I corrected it. DIV1-D is a knapsack problem, actually is a dependency 0-1 knapsack problem, But the dependence is very weak. So we prefer to use a grouping 0-1 knapsack problem model to solve this. The expect score is trivial, so let us focus on the penalty. You can found the penalty system in the problem is a little bit different against the reality, that is once we start solving on those large point, we'll never back to solve a small point. This declare is obviosly true. Then, for two large point u, v, let us denoted by (t, f) for time and fail probability. tu fu (1-fv) < tv fv (1-fu) . Once the principal contradiction is grasped, all problems will be readily solved. Sort the problem by the above function. Running a 0-1 knapsack problem. As we want to minimize the penalty, it'll be a wise idea that we use the second dimension of the dp array, record the maximum expected save of the penalty. why it has different answer? calc root[toindex].c[s[strindex]] with new strindex. Probably this one happened. It can depend on compiler and OS. Also the same compiler on the same OS can reorder the parameters if it finds that to its advantage. One of them is correct, and one not. In div-1 1st prob:pretest 4 could have been avoided to increase successful hacking attempts. Agree with you!!! the more hacks contest have, the more enjoyable it is! А почему бы ему не быть рейтинговым? When will the rating update ? If there any problem, please update this blog. In problem Games, I get WA on test 17. In the test one of the cuts is "2 4 2 3", while the jury's answer is 2 0 2 5. How could it be right? If the part 2 3 2 4 was already cut, how can we cut 2 0 2 5? Won't we repeat the edge 2 3 2 4? Please note that the paper doesn't move during the cuts and you can cut along previus cuts but you have to cut at least one more unit line. I did the same mistake :( I believe this problem should have better definition of cutting even with a figure showing different situations. Could someone comment on possible strategies for div1-b checker ? Fit m vertices evenly on a circle with radius R1. Fit the other n — m ones evenly on a circle with radius R2 < R1. This can always be done, except when m = 3 and n > 4, I don't know the reason for this yet though. This will guarantee that you cannot form a polygon whith more than 4 vertices selected from both the first and the second set of points. So, if you have M>3 or if M=3 and N<=4 then the given strategy will provide a good solution. My guess about the checker is to run Convex Hull algorithm(O(nlgn)) on your points and see if the output is m or not. I am sorry I misunderstood your question. My guess for how the checker works for this problem is that it sorts the output points clockwise or anti-clockwise, and then it used a dynamic programming algorithm to find the maximum convexity of the points. If the maximum convexity is equal to M, and there are no 3 points situated on a straight line (which could be verified in N^3 complexity, given that N is no bigger than 200) then the solution is considered correct. As for the Convex Hull algorithm, I do not believe this algorithm would have found the maximum convexity of a set of points (consider a hexagon inside a square, the convex hull algorithm would say that the maximum convexity is 4, which is not correct) . First of all, check that no three points lie on the same straight line. 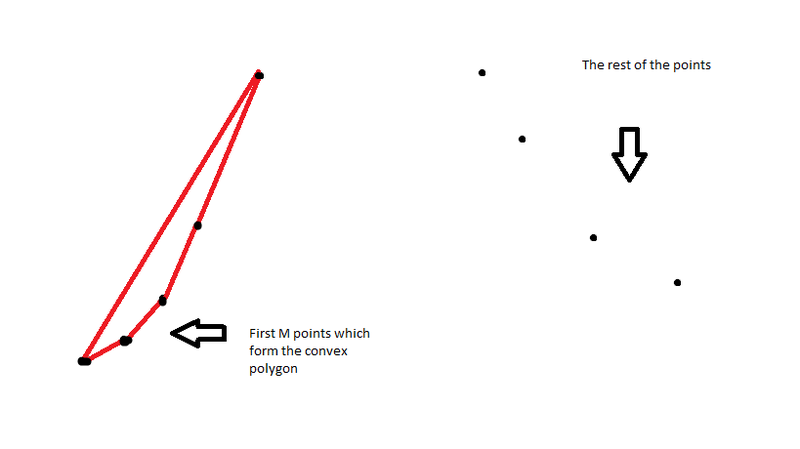 Then iterate over all points, and assume that the i-th point is the leftmost point of largest convex polygon. Sort all the points to the right of i by the angle relative to the i-th point. Fast System test is awesome, hopping rating update be as fast as it .... every contest. In problem div1-C, the sentence "that is the knife has to touch the part of the paper that is not cut before." is ambiguous. One could understand, as in my case, that the knife can only touch the part of the paper that is not cut before. My submitted solution in contest time was written according to this interpretation. Please, try to be clearer the next time. I find it clear. In your interpretation, it'd be "cannot touch the part that was cut before" — exactly to remove the possibility of this ambiguity. But if you're not sure, you can still ask an official question — they're answered pretty fast. I also asked the same question during the contest. Maybe it should have been better to make a public clarification since lots of people asked about it. The same here ; /. In fact it's our fault, but that's not a good thing when many contestans got the description wrong :d.
I think for this kind of ambiguous, one of the best solution is to have it in samples to resolve it. Samples are not used for testing, but are used for better understand the statement and resolve the ambiguous. The current samples are already very good that resolved the ambiguous of "it is not guaranteed that the cuts were obtained during any correct game". Hope it can be better next time. You don't get TLE (Time Limit Exceeded), but Runtime Error. Download the test, run in your environment, debug. Edit: Aha, you can't download the test. But repeat the last full line 30 times and you should get runtime error locally. I did with your prog. Don't declare all the letters in advance. You used global variable L, where you should have a local L. Probably your compiler optimized the code incorrectly, not expecting that the value of L could change inside the loop. Actually it is changed inside recurent calls to dfs. Incorrect optimization surprisingly gave expected behavior in your environment. I bet you don't use gcc, do you? What's your compiler? Will the editorial be public? in problem div 1 C "You are given an n × m piece of paper" "(0 ≤ xbi, xei ≤ n, 0 ≤ ybi, yei ≤ m)" how can be both correct? if 0<=xbi<=n and 0<=ybi<=m than we are given n+1 x m+1 piece of paper no? Is it please possible to have as many rounds in the weekends as possible? For ex, the next div2 round is on monday and i don't see why it was not scheduled on sunday. For people from western europe the 7:30pm from russia is really bad during work days. Server time: Apr/19/2019 01:51:10 (f2).